I feel the need to point out that the chart depicts the chord tones for each chord on a single string. In order to play these chords, we’d need to move the chord tones to the nearest location on an unoccupied string. That’s where knowledge of the notes on the fretboard becomes imperative. 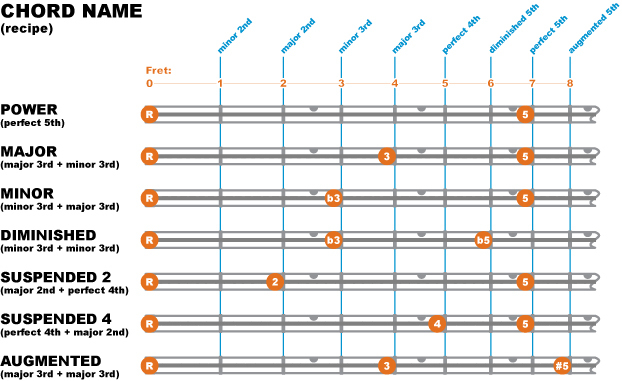 The purpose of this chart is to help you visualize the differences between each of the chord types and aid your memorization of the interval recipes. With regular review, you’ll memorize them in no time! Good luck!